In last night’s New York Ranger win against the Philadelphia Flyers, Rangers defenseman Mark Staal was smacked with the puck in what was intended to be a slapshot by Kimmo Timonen. 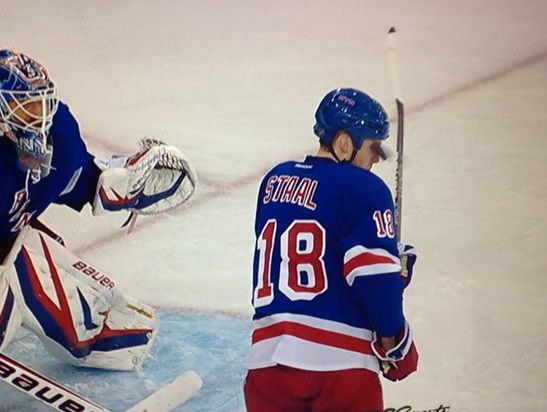 The puck was deflected off the stick of Flyers’ Jakub Voracek and landed on Staal’s right eye. Take a look at the shot here. This is not the first time a player has been injured due to a lack of protection. Back in the 2005-2006 season, AHL player Jordan Smith of the Portland Pirates lost vision in his left eye after a puck to the face. Philadelphia Flyer Chris Pronger has not returned to the game as of yet due to an injury in 2011 in which he was hit with a stick. Despite Staal’s injury, the Rangers took a 4-2 win against the Flyers. The team also claimed defenseman Roman Hamrlik this afternoon as he was taken off waivers, so hopefully losing Staal for a few games won’t hurt the Ranger’s odds for the rest of the season. What are your thoughts on visors? Should they be regulated by the NHL?